The deed was recorded at 10:45am the day before yesterday and we got the keys at 11:45am that morning. Our realtor called us to tell us about the deed transfer and an agent from the agency stopped by to hand over the key to the new place. And, suddenly it was all over and we were home owners from house hunters. The whole process took 60+ days from start to finish and 100+ days if we count the number of days from the time of our first offer on the property. And 3+ years if we count our entire house hunt. Yes it took 3 and 1/2 years to find a house that would become a future home for us. The home is being fumigated as I write this post and the guy from the termite agency said that its okay to enter Monday evening. This property was a foreclosure, and vacant for the past few months, so there is dust and dirt and cobwebs in the closets. It needs a thorough cleaning before we can move in. We hope to move in by Wednesday next week, as that our last day in the apartment after 4 extensions because of the loan. Will keep everyone posted in real time along with pictures of the home. What can I say, shiny appliances make me happy. Just looking at the gleaming appliances in stores, with their buttons and LEDs and dials makes me so happy. The new home came with its own 5 burner gas cooktop , double wall oven and a dishwasher. So, we needed to buy a refrigerator a washer and dryer. 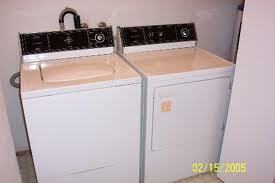 The home has a separate laundry room with enough space for a side by side washer and dryer so that wasn’t a problem. The refrigerator though had to fit into its built in alcove. Our small fridge in the apartment was bursting at the seams and since most top freezer ones in apartments are 14-20 cu ft, we decided that an upgrade in terms of size to 24-26 cu ft would be perfect. When we measured the actual dimensions of the cabinet they were 39 x 26 x 71, that meant that a 25 cu ft fridge would leave a couple of inches of space on either side, which is a magnet for dust bunnies, cheerios, legos etc. So we decided to upgrade to the next size, 28 cu ft. 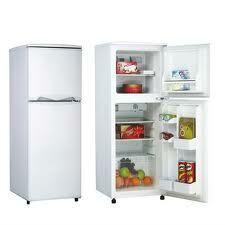 This would work perfectly in the space and the extra real estate that it remain unused by our family. So a 28 cu ft refrigerator it is. Our apartment complex has 40+ units and 4 washers and 4 dryers available for all the occupants to share. Though the washers were upgraded a couple of years ago the dryers and old and cranky. Every few weeks a couple of them sulk and stop working. When they work, its a delicate balance that you have to maintain to get your clothes to dry, sometimes they are still wet after going for a spin in the dryer and sometimes they crisp up like fries. So, I’m definitely glad and thankful to be getting my very own washer and dryer. Now I can do laundry whenever I want and no more waiting for the person before me to empty the washer or dryer. We ordered them yesterday and they will arrive next week, once they arrive I will post a separate post on how we bought them, how much we spent and why we selected those particular models. Wishing everyone a very happy 2012! May all you decorating dreams come true.